Asianart.com presents a special on-line exhibition for the annual spring Asian Art week in New York City. Below please find a selection of offerings from leading galleries, including Asianart.com galleries and other members of Asia Week New York, Japanese Art Dealers Association and The Asia Art Fair. Extensive information on Asia Week New York can be found at: www.asiaweekny.com. 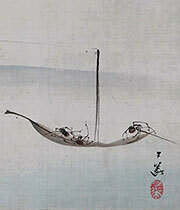 Further information about the Japanese Art Dealers Association can be found at: www.jada-ny.org. Nicholas Grindley Works of Art Ltd.
17 E. 71st St., 4th Fl. 17 E. 76th St., 3rd Fl. 595 Madison Ave., 8th Fl.